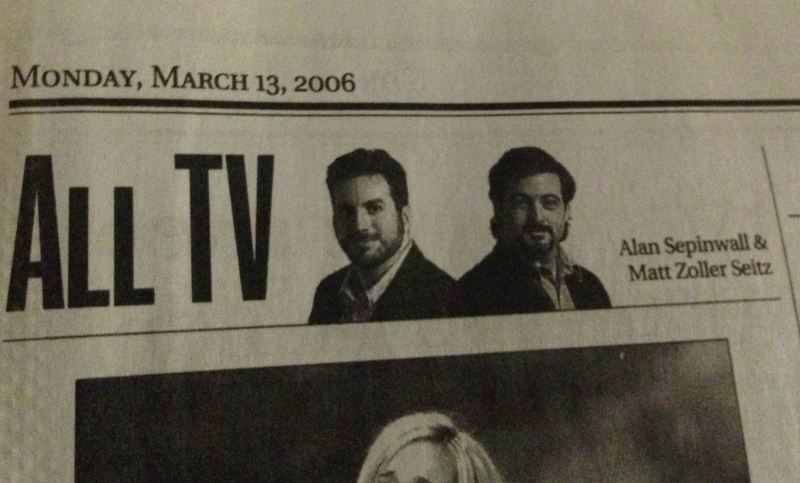 I'm pleased to announce that HitFix TV critic Alan Sepinwall and I are writing a book together. It's an anthology-reference book, as yet untitled, collecting essays on the most significant TV programs in the medium's history. It will be published by Grand Central Publishing in 2016. All the material will be original. A New York Times story about the book is here. The book came about because, like a lot of critics who've done this job for a while, we often get asked to recommend shows that will give people a sense of the medium's history and artistic development. It's a big medium that tends toward serial storytelling, so it'd be hard to cherry-pick even if significant titles didn't run for hours, or tens of hours, or days. So we decided to create a book of individual essays on specific series—sitcoms, dramas, miniseries and other formats—that had a profound impact on TV as both business and art form, the better to help people make those viewing choices and maybe inform the experience. The press release is below. I should also say parenthetically that Alan is one of the very best collaborators I've ever had. We used to write a column at the Star-Ledger titled All TV (a rather fashion-hideous mugshot is above) that was truly collaborative. I wrote some items, Alan wrote others, and still others we'd write together, with one of us sitting at the keyboard while the other guy paced and yammered. We were looking for a project that would give us an excuse to do that again, and lo and behold, years later, here we are. Grand Central Publishing (Executive Editor Ben Greenberg) just acquired the North American rights (from Amy Williams of McCormick & Williams) to a book on American television by noted TV critics Alan Sepinwall and Matt Zoller Seitz. We’re planning to publish in Spring 2016. UNTITLED by Alan Sepinwall and Matt Zoller Seitz will be a whirlwind tour of television via critical essays on many of the most artistically and culturally significant American dramas, comedies, miniseries, variety shows and more; all while surveying American television history and charting the medium's development over the course of the last six decades. The book will contain a mix of lively entries on critically acclaimed and commercially successful classics such as Seinfeld, The Sopranos, Star Trek, The Simpsons and Twin Peaks, as well as illuminating essays on short-lived favorites such as Taxi, Freaks and Geeks, and My So-Called Life, all of which are sure to spark conversation and debate among readers. In the vein of Halliwell's Film Guide and The New Biographical Dictionary of Film, Sepinwall and Seitz's book will be an absolute must-have for television and film buffs and for young enthusiasts who, fresh off their latest Netflix binge, are looking to greatly expand their knowledge of the medium and wondering what show to start streaming next. This book will be the final statement on American television. Alan Sepinwall has been writing about television for close to twenty years. Formerly a TV critic for Newark's Star-Ledger (Tony Soprano's hometown paper), where he and Seitz wrote a daily column about TV together, he currently writes the popular blog "What's Alan Watching?" on HitFix.com. Sepinwall's episode-by-episode approach to reviewing his favorite TV shows "changed the nature of television criticism," according to Slate, which called him "the acknowledged king of the form." He is the author of The Revolution Was Televised: The Cops, Crooks, Slingers and Slayers Who Changed TV Drama Forever (Touchstone, 2012), which The New York Times' Michiko Kakutani named one of her 10 Favorite Books of 2012. Matt Zoller Seitz is the TV critic for New York Magazine and Vulture.com, where he writes about current and classic TV and recaps notable series, including Mad Men, Breaking Bad, and Homeland. His books include the New York Times bestseller The Wes Anderson Collection (Abrams, 2013) and the forthcoming The Oliver Stone Experience (Abrams, 2015). He is the editor-in-chief of RogerEbert.com, has written, produced or edited over a hundred hours' worth of video essays on film history and style, and was a finalist for the Pulitzer Prize in criticism. He founded the influential film and TV blog The House Next Door, which is now a part of Slant magazine, as well as IndieWire's Press Play.